Michael Bay officially announced in February that he would once more return to the franchise he’s best known for, and taken to incredible worldwide success. The third film, Transformers: Dark of the Moon, was originally to be both his and Shia LaBeouf’s final in the series last year, but Paramount managed to persuade the director to come back for them once more, in turn financing his lower-budgeted Pain and Gain, due out early next year. 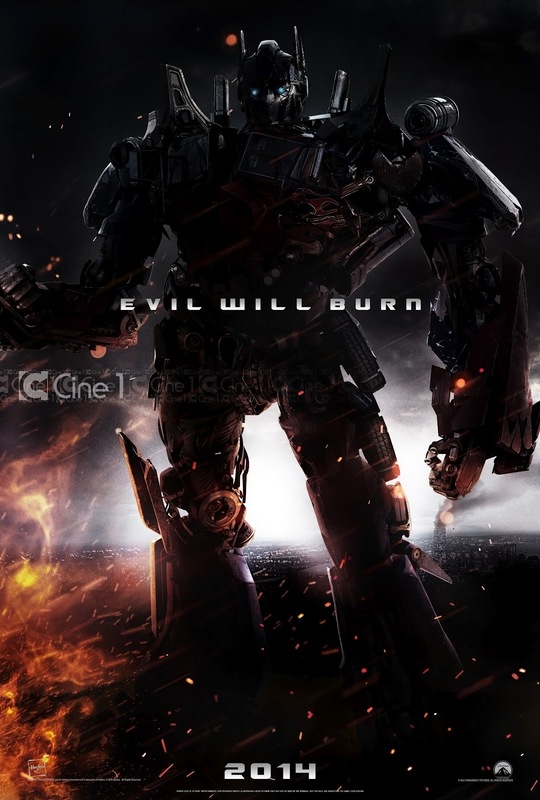 With Pain and Gain in post-production now, Bay will be moving ahead to the as-yet-untitled Transformers 4, and now Cine1 have released what looks to be the first promo poster for the film, bearing the rather awesome slogan, ‘Evil Will Burn’. There may perhaps be questions of its authenticity, given how early it’s being released, but long campaigns are of course becoming more and more standard, and a nice early tease like this isn’t unwelcome in the slightest. Dark Side of the Moon took an enviable .1bn. at the international box office from a 5m. budget. I loved the first film, and thought Revenge of the Fallen didn’t have quite as good a story as I’d hoped for, but Dark Side of the Moon was a brilliant end to the first trilogy. This reboot is set to give the robots a new design, and is set to have the Transformers themselves front and centre, rather than a human-driven piece. But of course we know that the Autobots have plenty of emotion (and general all-round awesomeness) to carry the film, so we shouldn’t have any worries there. Ehren Kruger, who penned the second and third films (as well as the brilliant Scream 3), will be back once more writing the script, and as yet what cast there will be remains unknown. Transformers 4 is due to be released on 27th June, 2014, and given that Dark of the Moon used 3D so well, I wouldn’t be surprised at all if Bay goes for the third dimension once more. We’ve got a long way to go before it hits, but I have a feeling it’s going to be incredible. As usual with this great first promo poster, you can click to enlarge. I didn’t recognise him at first, but this looks to me like the re-vamped design of Optimus Prime himself. Immense.